After writing the HOUSE M.D. game (featuring a character inspired by Sherlock Holmes), and after writing an episode of the LAW & ORDER: LEGACIES game (based on the LAW & ORDER television series, which wouldn’t be possible without Sir Arthur Conan Doyle’s Sherlock Holmes stories, which jump-started the whole “detective story” genre in the late-19th century), in 2015 I was hired to write the screenplay for an actual honest-to-goodness SHERLOCK HOLMES videogame. It was to be called SHERLOCK HOLMES: CRIMINAL INSIGHT. (That was the working title, anyway.) I devised five murder mysteries for the game, did a ton of research on “true crime” cases, and thought up some really cool ways to update the Sherlock Holmes character for the 21st century. I worked on this game with the folks at Legacy Games for most of 2015, and then…the game was cancelled. Shut down. Unreleased. Why? Long story. I’d rather not get into it. So I don’t even have any artwork from the game to show here. Sorry. 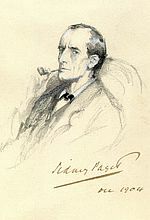 (This image I’ve included here is a portrait of Holmes by legendary artist Sidney Paget, who illustrated Sir Arthur Conan Doyle’s Sherlock Holmes stories when they were originally published. Pretty classy, right?) It’s a shame the SHERLOCK HOLMES game was never completed or released, but it was a really fun project to work on. And as always, I loved working with the Legacy folks on this game.